Spain ranks third among EU countries in which counterfeiting has the greatest impact on the sporting goods sector, at 15.7 % of sales, more than twice the EU average (6.5 % of sales), behind only Lithuania and Latvia. Nevertheless, in absolute terms the greatest impact is in France and Spain, these two countries accounting for one-third of lost sales due to counterfeiting in the EU, amounting to a total of 492 million euros. These are the main conclusions with regard to Spain in the recent report entitled "The Economic Cost of IPR Infringement on Sports Goods", issued jointly by the OHIM's European Observatory on Infringements of Intellectual Property Rights and the European Patent Office. According to the report, total consumption of sporting goods in the EU in 2012 was estimated at 7,500 million euros, with 4,271 companies manufacturing products of this kind, employing 43,000 workers in the EU. 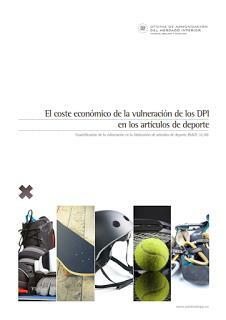 In addition to the direct repercussions of counterfeiting in the form of lost sales by lawful companies in the sporting goods sector, other economic sectors are also indirectly affected, suffering losses of 361 million euros. Government revenues are also impacted, with lost taxes (VAT, income taxes, corporate taxes, and social security contributions) estimated at 150 million euros. The direct and indirect impact of counterfeiting in this sector on the EU economy is estimated at around 850 million euros and 5,800 lost jobs. The report takes into account only manufacturing of sporting goods and equipment as such (e.g., golf clubs, tennis rackets and balls, skis, etc. ), excluding sports apparel and footwear, so the economic costs associated with the counterfeiting of sporting goods are in fact higher than those estimated by the report.